Do I Have Allergies, Or Is It a Cold? Spring has sprung! So you're sneezing, coughing and you have a runny nose. Are you sick or do you have allergies? The differentiation can be frustrating for patients and their doctors! So many symptoms of a cold can also be present in springtime allergies. Your symptoms may include congestion, sneezing, coughing, runny nose and a frontal headache. Even fatigue, more common when fighting a cold, can come from allergies, especially if all of that nose blowing and coughing is ruining your sleep. All of these symptoms are nonspecific because they can result from your body's immune system fighting an infection OR your body releasing histamine in response to an allergen it recognizes as foreign -- dust, pollen, certain foods. Have a fever? It's a cold not allergies! Itchy, watery eyes? Usually allergies, although you can develop pink eye from a cold. How long are your symptoms lasting? 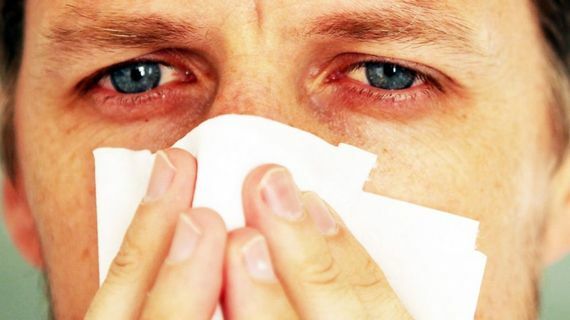 A cold rarely lasts longer than 2 weeks; allergies can go on for much longer. What's the time of onset? If symptoms came on gradually, it's more likely a cold (2-3 days after virus exposure); if they come on fast (like you wake up one day sneezing and tickly throat) then it's more likely allergies. Sometimes the answer doesn't come as easily as we'd like and it's left up to trial and error - taking a mental note of what's helping you and what makes your symptoms worse is a great idea. If you know the cause, you can take aim at the treatment appropriately. If you indeed have a cold, the most important steps to take are REST and fluids. Taking contact precautions like frequent hand washing helps to prevent the spread of a cold, while over the counter decongestants and an anti-inflammatory for pain can help you get through the day. If allergies are plaguing you, it's all about avoiding the allergen, but this isn't always easy! Antihistamines are the mainstay of blocking our allergic response. Daytime pills are now available over the counter that are non-drowsy: Allegra, which doesn't cross blood-brain barrier, is a great choice, as are Claritin and Zyrtec. Benadryl (diphenhydramine) is effective but dries you up and makes us all sleepy. It is actually the ingredient in many over the counter "sleep aids" like Tylenol PM and Advil PM. So it is a great choice for nighttime to help you sleep while decongesting. Make sure to drink plenty of water to combat its effects. Many eye drops are available for allergies as prescription. I advise my patients to avoid the over the counter allergy drops because over time they don't treat the underlying cause of allergic eyes and may create a vicious cycle where you need more and more! See your doctor for a prescription for any one of several excellent once-a-day allergy drops we have available to us now. A nasal spray like Flonase is great for nasal congestion and also helps eye symptoms! Speaking of eyes, a cold compress each morning will help to bring down any swelling in your lids. Sleeping with a couple of pillows may help decrease those dreaded dark bags that so many people deal with allergy season. Take a look at why we've nicknamed these eyes "Allergic shiners!" These medications can help when you're outside on that gorgeous spring day or you can't control the dust in the office. At home, keeping windows closed helps prevent outside allergens from getting in. Now is a great time to have your air conditioning system checked and any filters your system may have changed. A HEPA filter for your home is an excellent way of clearing out pet dander, mold spores or other in-home allergens that could be aggravating your symptoms. And your carpet may be harboring allergens that your vacuum doesn't get rid of so considering a professional cleaning as we head into spring. I hear it all the time: "It can't be allergies because I've never had them before!" Remember, our bodies are constantly changing and you may start suffering from allergies this season when you never have before! Since our bodies are evolving each year, so must we. Taking some of these steps can make your Spring a lot healthier and happier!